Though Brazilian football fans are known throughout the world for their passion and loyalty, Grêmio Foot-Ball Porto Alegrense is still a unique club in this regard. With over 8 million fervid supporters in the country and approximately 100,000 associates worldwide, Grêmio is one of the most beloved clubs in Brazil. The club’s anthem says it all: “com o Grêmio onde o Grêmio estiver” (with Grêmio wherever Grêmio may be). The club was formed by Cândido Dias (an entrepreneur from São Paulo) and 31 Porto Alegre locals, who mostly hailed from the city’s German community. The official foundation date was September 15, 1903, and the club’s first president was Carlos Luiz Bohrer. In their debut match, Grêmio defeated Fuss Ball Porto Alegre 1-0. In 1909, Grêmio trounced the just-founded Internacional 10-0, setting up the stage for one of the fiercest football rivalries in South America. Soon enough, the derby earned its own name (Grenal) and started drawing record attendances. To this day, this rivalry has been known for its competition, high levels of emotion, and the occasional bouts of violence. 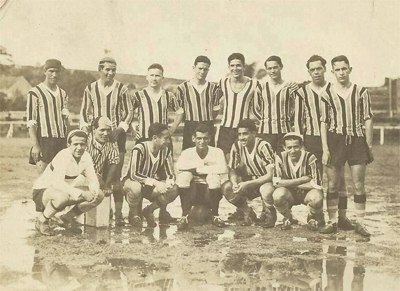 Team picture on muddy field in 1932. Grêmio won a number of state championships between 1921 and 1980 (a nation-wide league wasn't founded until 1959), which put them high in the running for the most successful Brazilian club of that era. During the early ‘80s, they went one step further by renovating their stadium, the Olímpico Monumental. All of a sudden, Grêmio could count on the best fan support in the country, which played a big part in their later exploits. The champion team of the 1983 Copa Libertadores. Following a short period of poor play, Grêmio bounced back by appointing Luiz Felipe Scolari as head coach in 1993. During his 3-year tenure, the club won another Copa Libertadores in 1995 and a Brasileirão title in 1996. This stretch is best remembered for the epic quarter-final match against Palmeiras in the 1995 Copa Libertadores. After a convincing 5-0 victory in the first leg, Grêmio lost the rematch 1-5 and had to rely on Jardel’s lone strike to go through. Despite the fact that the recent years haven’t been as kind to Grêmio, they were still posting reasonable finishes throughout the 00’s. In 2008, they were expected to expected to finish in the bottom half of the Brazilian league; however, the team responded by playing a fun brand of football and ultimately placing 2nd. Four years later, Grêmio finally said goodbye to the Olimpico and moved to the brand-new Arena do Grêmio. In 2017, Grêmio became the third Brazilian club to win tree Copa Libertadores trophies. They did so by defeating CA Lanus 3-1, with striker Luan Vieira being voted player of the tournament. At the subsequent FIFA Club World Cup, they were narrowly defeated 1-0 by Real Madrid in the final. The round logo resemblance a football and have text against white and black background. 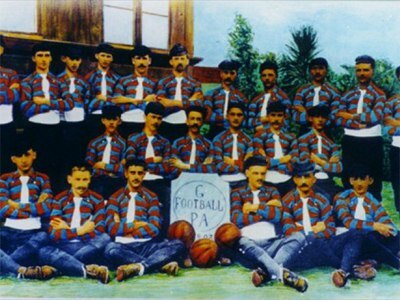 The letters tell about the foundation year, the name of the team and the initials "FBPA" for Foot-Ball Porto Alegrense. Sometimes three stars – in bronze, silver and gold – are visible above the circle, these symbolize victories in World Club Championship (gold star), the South American competition victories (silver star) and the represents the National competitions (bronze star). 1903 The club is established. 1919 First time Campeonato Gaúcho champions. 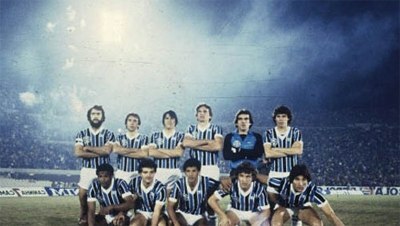 1981 First time winner of the Brazilian first division. 1983 Winning their first Copa Libertadores. 1983 Winning the Intercontinental Cup after defeating Hamburger SV. 1989 First time winner of Copa do Brasil. 1996 Winning their first Recopa Sudamericana. 2001 Ronaldinho is sold to PSG for a €5 million fee. 2012 The club move to the Arena do Grêmio.